Students submitted a record 411 applications for the Summer Internship Grant Program this year. The program, which accepted applications until Tuesday night, is in its ninth year of existence and provides financial aid for students pursuing unpaid summer internships. Due to increased funding from alumni and the administration, Mark Presnell, executive director of Northwestern Career Advancement, said the program is projected to increase grant amounts by $500, totaling $3,000 per student this year. It also plans to provide more total grants. The program, originally organized by Associated Student Government, Northwestern Alumni Association, Undergraduate Financial Aid and NCA, continues to receive an increasing number of alumni donations, grants and gifts, in addition to funding from the administration. The program aims to select students demonstrating sufficient financial need and interest in a certain career path to receive compensation for living costs that might otherwise make internship opportunities impossible. In order to apply, students submitted three essays focusing on their career interests, their potential internships and their financial need, in addition to a resume. “The one thing that makes the application fantastic is that you don’t need to have a certain internship in mind when you actually apply, which means that that part of the application process is not stressful for you,” said Communication junior Amanda Walsh. Walsh, who received a SIGP grant last year to pursue an internship at a nonprofit company called Designs for Dignity, was allowed to submit an application to the program for a second time this year after a rule change that now allows students to potentially receive SIGP grants multiple times. “For students who are going into a certain kind of career path, they may have multiple unpaid internships, so we removed that restriction this year as well,” Presnell said. Application numbers for the program have steadily increased since it started in 2007, when 90 applications were received and 10 grants were provided. In 2014, 287 applications were submitted and 70 grants were provided. 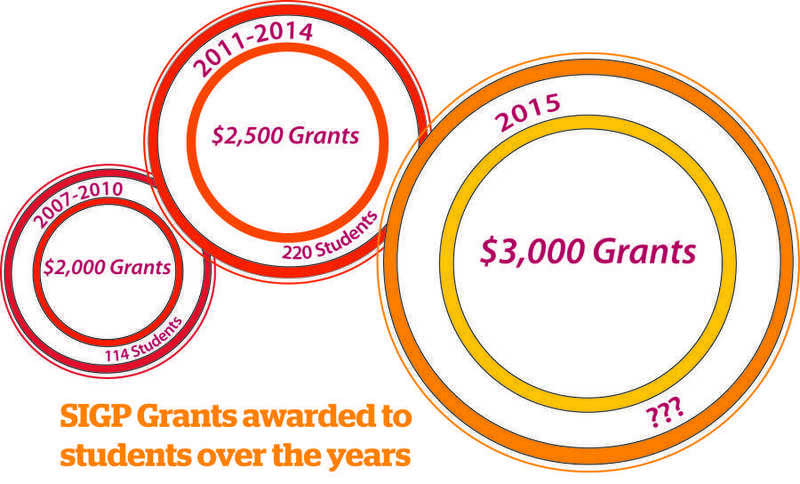 Grants were originally $2,000, and were increased to $2,500 dollars in 2011. Selected students will receive $3,000 this year. Presnell said the grant size was primarily increased to allow students living in major cities to pay for climbing rent, food and transportation costs. Weinberg freshman Jonathan Wrobel, pursuing a SIGP grant to fund his Washington, D.C.-based summer internship at digital security organization CommunityRED, praised the change. Grant recipients will be announced mid-May.